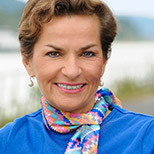 Executive secretary of the United Nations Framework Convention on Climate Change from 2009 to 2016, Christiana Figueres was instrumental in forging the historic 2015 Paris climate agreement. She has received numerous awards and honors, including the Great Cross of the Order of Merit of Germany, the Legion of Honor of France, and the 2015 Medal of Honour from The Guardian. She was named 2015 Global Thinker by Foreign Policy magazine and one of the World's 50 Greatest Leaders by Fortune magazine in 2016. OPINION: We’ve done a good job of envisioning a better world. Now we need to build it.